This is just a great representative example of an Andersen Forge Hunter. I like them - personally in use - about 4 1/2+ inches long. I just appreciate the work I can perform with a blade this size. Hot-blued Twist Damascus of 1095 and 15N20. Stabilized Feather Walnut from Northern California. Going to be happily living in Iowa for a while! Here I have a 7 1/4" "S" guard Fighter made from W2. 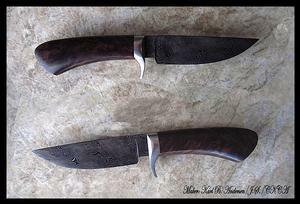 I did the normal clay processing on this W2 blade and played around some with exposing the hamon. It's sort of a "hybrid" hamon in that I did not leave it "as etched" showing extreme contrast, nor did I do a long process of hand rubbing. This is sort of somewhere in the middle and I lke the subtle exposure I achieved. It should be eveident in the photos. It was deeply etched, and the lightly hand rubbed. The hamon is still easily visible. The Stabilized Curly Maple handle speaks for itself! The easy "S" guard is 1018 hot blued mild steel and is part of a full take-down assemble. Just a real joy to hold and fondle. Could easily substitute for a camp knife. This was built to a customer's specs to be picked up at an upcoming knife show in Little Rock Arkansas. The W2 Tool Steel blade is well over 10 inches long! I used the common clay processing to develop the distinctive hamon often seen these days in shallow hardening steels. The Lazy "S" guard is hot-blued mild steel. What sets off the entire package is the extraordinary piece of Desert Ironwood I was able to acquire for the handle. It simply speaks for itself. She will reside happily in England. Here is a Hunter I worked up for a really good man who gave it to his son for Christmas to honor his year in deer hunting. I forged this blade from a 1 1/8" round bar of W1 tool steel. Gave the blade a clay processed procedure to facilitate the distinctive hamon. I used a piece of stabilized bocote that I have had on-hand for well over five years. I thought this knife was the perfect knife upon which to use it. Stainless steel fittings were used in creating the Andersen Forge Take-Down assembly. It should offer a life-time of hard use service. Some spectacular chatoyance sets off this distinctive laddered Damascus blade on this Hunter headed for Southern Illinois! The 324 layers of 1095 and 15N20 tool steels were hot-blued after final knife completion. The stainless steel guard is one component of the take-down assembly which allows full maintenance of the solid Ebony handle. This beauty should offer a life-time of deer hunting pleasure!! Appropriately named for the customer, who lives in Alaska. This was forged from a large diameter bar of W2 Tool Steel to end up 10 1/4" inches long, with a dramatic clay processed hamon. The individual 416 stainless take-down fittings were faceted and then polished on the facets to show contrasting hues of light reflection. I enjoy the "jeweling" effect this gives the light when it dances! A beautiful piece of stabilized California Feathered Walnut tops off the package. I really and truly do love to play with contrast when making my knives. On this one, I think the hot-blued guard dances nicely with the dark etching on the 1095 core steel of the three piece San Mai. The contrast is the 416 stainless "jacket" on the San Mai. Add in the Desert Ironwood and I think we have a winner folks! A beautiful combination of clay processed W2 Tool Steel and some stabilized feather walnut from California. Included is a stainless steel guard and what I call my Bull's Eye Pins to cement the mortised handle to the frame. A light and quick hunter that will be a joy to own. I had a great new customer order something that I thought went together quite well! 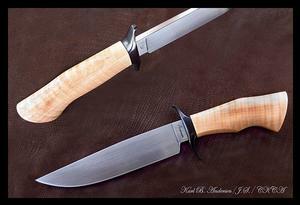 Also, it's the second new knife to come from the new Andersen Forge now located in northern Minnesota. The San Mai blade was forged from a billet of 416 stainless steel and 1095 tool steel. The guard is 416 stainless steel and that gorgeous handle is Premium African Blackwood. She should make a wonderful companion and quite an addition to any activity - outdoors or not! This is the first knife I made in my new Andersen Forge set-up after moving to Northern Minnesota. As well, the steel is the last bit of Damascus made from the last billet I forged while still living in Illinois just before moving north. So, "Illi-sota" is not all that far fetched. I milled out the area in the tang where the scales go, which are stabilized curly walnut from the far north reaces of northern California. The Damascus is 324 layers of 1095 and 15N20. The spine was mirror polished prior to hot-bluing the entire blade. Now, oddly enough, it was immediately purchased and is headed right back to Illinois!